My daughter is learning a catechism. We’ve been reviewing these for about thirty weeks now and something new just hit me! Q: How do we learn about God? Q: Where does God reveal Himself? A: In His word and in nature. God reveals himself through His word; therefore, we must study His word. Every Christian knows that. Christian homeschooling families put a high importance on the Bible. But this is my eye-opener — God reveals Himself through nature; therefore, we must study nature! There is actually a theological reason to study nature! God reveals Himself (His character, law and wrath) through the natural world that He created. If we neglect to study nature, we will probably miss some truths about Him. I don’t want to miss it! I want to learn all I can. And more importantly, I want my daughter to see God through nature. I would never dream of omitting the Bible from our curriculum. Likewise I should not omit the study and enjoyment of nature. DD’s answer this week was, “He’s amazing! 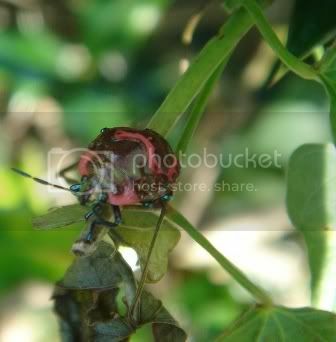 He made those insects so beautiful!” Yes! God revealed His Divine Creator character to her through nature. I’m not talking about worshiping nature here. We understand what animism is, and we don’t fit the bill. I’m talking about seeing up the beam of light all the way to God (as C.S. Lewis said). You know, I blogged about the nature walks mostly because I knew that if I did, I’d be accountable to my readers to DO it. But now I see that I’m actually accountable to God to lead my daughter in the study and enjoyment of nature! Would love to highlight this article on our Shining Dawn Books site. What do you think? Wow Jimmie! You have spoken to my heart! I LOVE, LOVE, LOVE this article! I’ve always made the connection that you could find and learn about God through His creation; but to actually realize and proclaim this is a duty, WOW! Now, I totally understand why God has called me into nature so strongly and I’ve felt there’s a movement back towards nature study again. With modern technology and the busyness of life, His people have become disconnected from Him in His Creation, and haven’t even realized how important that is. Yes, we’d love to feature this article on our Shining Dawn website if you will allow; and I will certainly link to it from my blog too. This is SO well said and I believe a crucial reminder to parents. I have a long list of reasons I homeschool, but one close to the top is that my children get to spend quite a lot of time outdoors, especially since we live on 46 acres! I cannot fathom them sitting in a desk indoors all day. Even before we moved to our little place in the woods, we frequented every local nature preserve and park. So many kids these days are never taken out to explore nature, are rarely reminded of its incredible intricacy, and I think that is so sad and removes from their lives the most vivid reminder of what an awesome God we have. My girls often make remarks like, “How could anyone believe in evolution when they look up close at a leaf or a butterfly?” This is one of the most important lessons I have imparted to them as a mother and their educator. Only God could have created the miraculous details and endless variety and beauty we find in the natural world. I think they will never doubt His sovereignty and love for them. This Collage is just wonderful Jimmie! If I had had this when I was just starting out and exploring Charlotte Mason I would have been doing a happy jig, and even as a grizzled homeschooler of seven years, I think it is just a wonderful resource! I couldn’t agree more, and you said it so well! My heart aches for the scientists that are so knowledgeable about the natural world and yet don’t see or hear the God who made it. The tiniest and most “insignificant” things my kids and I have found on our nature walks have spoken such loud things of the goodness and creativity of God! Thank you for re-posting this, Jimmie! Thank you for this reminder that God reveals Himself through nature and to Whom we are accountable. AWESOME, and so well said! First – I have referenced this page at least a dozen times while talking to friends. Second, Have you read Last Child in the Woods? Third, thank you for using your gift of words to say what my heart says every time I look outside! This is why we YEARN to be outside and even if you are not an ourdoorsy type – even a walk is peaceful! Praise God for His creation…. Oh, yes! I’m a huge fan of Last Child in the Woods! Here is my review. Very well said and for this exact reason I LOVE Science. .-= Sisterlisa´s last blog ..Homeschool Carnival: Virtual Blog Conference =-. I couldn’t agree more with this blog post! Well said! I just love your blog (happened upon it on an unrelated search) and I have shown 9yo dd your dd’s blog and she has been inspired to start her own. So, tell Sprite I said thanks! p.s. just loooove her cupcake toboggan (hat).